We recently had the pleasure to got invited by the IWCS (International Wood Culture Society) to show our work live at the World Wood Day 2017 in Los Angeles. After the event was done, they provided a detailed video what we would like to show you. Because it is small, you can use woodblock prints as greeting cards! Even with a frame attached, it looks good. Now we also have a compact series of products. Traditional technique that continues from Ukiyo-e! although small and completely handmade. The design is Ukiyo woodcut original. There are no other similar products. Cause of the small size, we were able to make a very reasonable price for such high quality! Welcome to modern times Ukiyo-e at Nihonbashi ! Nihonbashi was a center of Edo. 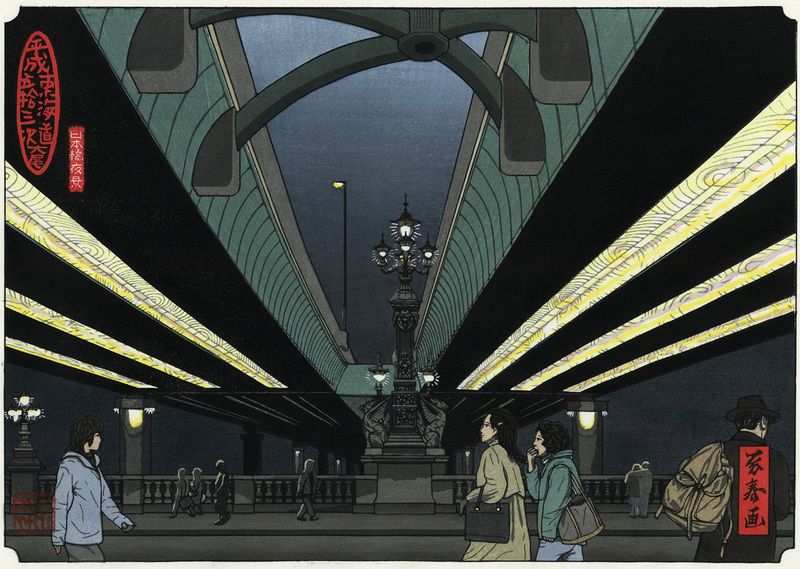 Many Ukiyo-e artists such as Hiroshige, Hokusai, Hasui have made Nihonbashi a subject for woodblock print (Ukiyo-e). But, in these latter days, it was covered with steel reinforced concrete. Tatuharu drew a picture of the real Nihonbashi that found artistry in such a scenery. And, His design become the modern times Ukiyo-e through Shokunins (Super Technicians) taking over traditional woodblock print technic since Edo period. Introducing the first produce of Ukiyomokuhan !! designed by Okamoto Tatuharu, digital woodblock artist. for vehicles even though National highway. traditional technic of woodblock print. the old memory when you are child. This is the 2nd NEW product produced by Ukiyomokuhan. Here is Shirarahama beach in Wakayama prefecture in Japan. 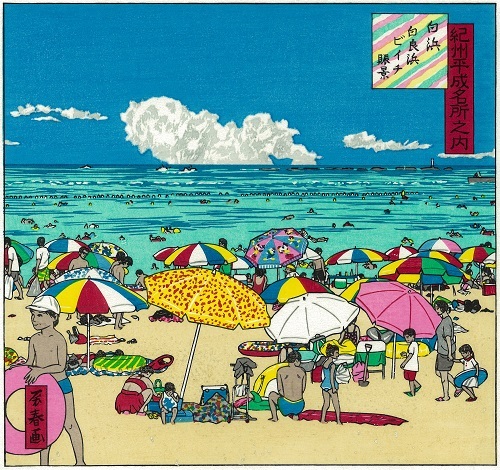 “Lively White Beach at Shirarahama in Kishuu Heisei famous views”. A lot of beach umbrellas are represented very detail and delicate carving, of course, 100% hand making. The gold and platinum powders are used to represent sand situation on the white beach, that is a special technic of Shokunin. 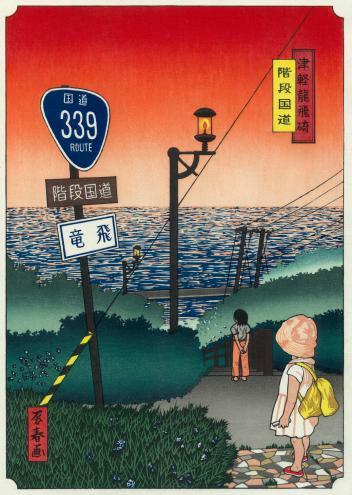 This is the ambitious new woodblock print you never seen before. "Ukiyomokuhan will send you amazing impression and pleasure"
Our company "Ukiyomokuhan" will provide Woodblock prints which is Japanese traditional industrial arts for the peoples all over the world. Wood Blockprints will make you enjoy with amazing impression you have never experienced in any other arts. Our Woodblock Prints are designed for present world (Ukiyo) in each eras since 200 years ago until now. We guarantee 100% handmade and 100% made in Japan as it is made by super technician "Shokunin" using Japanese materials.The design object will not be only for domestic in Japan, we will extend to other countries. And, we will create any other kind of designed Woodblock Prints, not only for landscape view. This handmade Wood Block is caved to very detail but printed to very grand, and it have high artistic potential you cannot experience in any other arts. Even though that, we will sell them in low price because we would like to many people can enjoy it as much as we can. We think you can make your relationships happy, if you give the Wood Blockprints to them for the gift. We are also happy as we can provide the high quality artistic Japanese products for many peoples all over the world.